The Progressive Caucus* hosted a photo exhibition, exploiting Monsanto’s risky activities, with the participation of the famous French-Venezuelan photographer Mathieu Asselin, who has been awarded for this photographic investigation with the Book Dummy Award (Kassel 2016), and received also a special mention for the Luma Rencontres Book Dummy Award at the Rencontres de la Photographie (Arles 2016). The exhibition was presented during the March’s plenary of the European Parliament (Strasbourg, North Gallery). During the presentation, M. Asselin mentioned: «What I try to do is look into the past of Monsanto, to understand its actions today. And maybe have a little window to the future of what will be Monsanto. With my photography I talk about contamination, about economic problems, pesticides, the copyrights of seeds. Hopefully, this is an ‘education tool’ for everyone to understand who Monsanto is». Opening the exhibition, Guillaume Balas (MEP, S&D), member of the Steering Committe of the Progressive Caucus said: «By hosting this exhibition we tried to show how Monsanto, through its whole history, contributed to the damage of nature and our health. We stand against these practices». Eva Joly (MEP, Greens), also member of the Steering Committee of the Progressive Caucus, continued: «It is impressive and important what you can see through these pictures of corruption, conflict of interests, despise of regulation. We should take care of the thousands of victims they left behind». 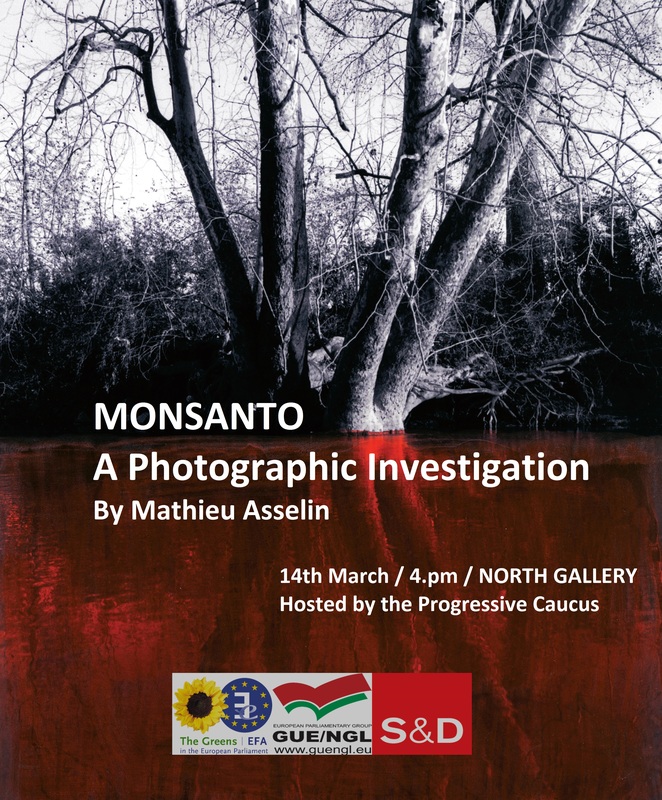 And Ernest Urtasun (MEP, Greens), who participates in the Steering Committee of the Progressive Caucus, mentioned: «This exhibition shows the danger of the activities of companies such as Monsanto and the need to further regulate their activities». Commenting on the exhibition, the vice-President of the European Parliament and member of the Steering Committee of the Progressive Caucus, Dimitrios Papadimoulis, stated: «The history behind Monsanto’s practices is a history of corruption, of indifference towards the lives of the many, it is a history of pain. Pain caused to thousands of people and their families that had to suffer the cost of this extreme ‘treasure-hand’ for wealth. It is progressive forces’ duty to resist together to these phenomena». Mathieu Asselin’s exceptional documentary process, conducted for five years through Vietnam and the United States, brings to the light older and current practices of this giant chemical industry. In order to construct his meticulous investigation, Mathieu Asselin consulted hundreds of documents – press excerpts, judgments, archives, films, and testimonies – focusing on facts or dates that dramatically illustrate the ravages of all kinds which mark the company’s long history of sprawling development. The drama of the small town of Aniston (Alabama, 1970), that became a ghost city as a result of releases into the air and water of the infamous and poisonous chlorinated PCB derivatives produced by the local factory, is just an example. The terrifying Agent Orange -another Monsanto product, an acid-based herbicide and defoliant widely known for its use by the U.S. military as part of its herbicidal warfare program on the plains of Vietnam from 1968 to 1971- permanently contaminated up to 10% of Vietnam’s territory and caused thousands of victims. The exhibition methodically illuminates another facet of Monsanto’s processes to establish its global grip: propaganda and communication. Whether they are advertisements describing an ideal world where chemistry and its derivatives contribute to universal well-being, or subjugating contracts signed by thousands of farmers condemning them to an unfair economic model and ecological nuisance, each document published by Monsanto can be analysed as an exercise in disinformation.